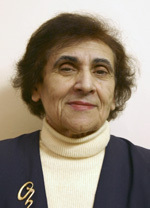 In 1958 graduated from Leningrad State University, the Faculty of Oriental Studies, the Department of Iranian Philology. From 1958 to 1961, took doctoral course at the Leningrad Branch of the Institute of Oriental Studies, the USSR Academy of Sciences (now the IOM RAS). In 1965, defended the PhD dissertation entitled Prepositions and Postpositions in Southern Dialect of Kurdish, Sorani [Предлоги и послелоги в южном диалекте курдского языка (сорани) ]. From 1961 up to 2016, researcher at the Leningrad/St Petersburg Branch of the IOS / IOM RAS (from 1992, leading researcher). In 1992, defended the Habilitation Dissertation entitled Kurdish Dialect Gorani as Represented in Literary Texts from the 18th through 19th Centuries [Курдский диалект горани по литературным памятникам XVIII—XIX]. Professor at St Petersburg State University, teaches Kurdish. Published more than 70 papers, including 6 monographs. Sypervised several PhD Dissertations. scarcely explored dialects of Kurdish as represented in written sources and folklore texts; edition of literary texts.